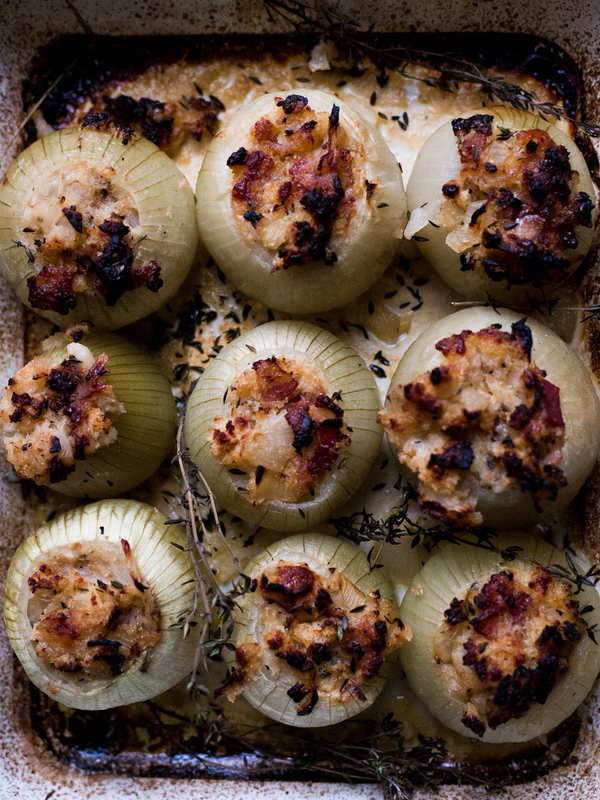 I’ve had this hankering craving for stuffed baked onions for a while now, which is a funny thing to say as I swear I’ve never actually eaten them. So I don’t know how that came about, maybe there have been some onion subliminal messages somewhere down the line or maybe I’ve seen a photo and it stuck. Anyway, I really can’t remember. The craving was enough to push me to eventually make them and share them with you now. Stuffed baked onions are somewhat ambiguous I suppose. I should enlighten you to what you’ll expect to find when you get stuck in there! I’ve gone for a little bacon, a little cheese and thyme. When I think of onions I think of Sam, my boyfriend. We have this running joke when I’m cooking something, he’ll come into the room and say “OHHHH, that smells amazing – what is it?”. Almost every single time the answer is onions frying in butter! I can’t smell it myself, but it makes me laugh on each occasion that happens. Start with onion and butter and you’re onto a good thing, at least according to Sam’s nose anyway. 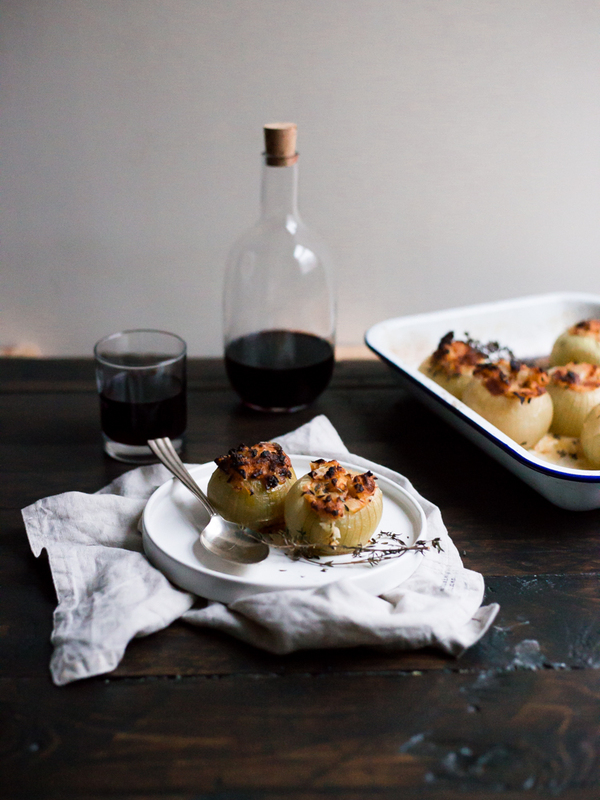 Don’t think of these baked onions as you might a regular onion. Braised first, and baked to perfect – they are sweet and delicious. 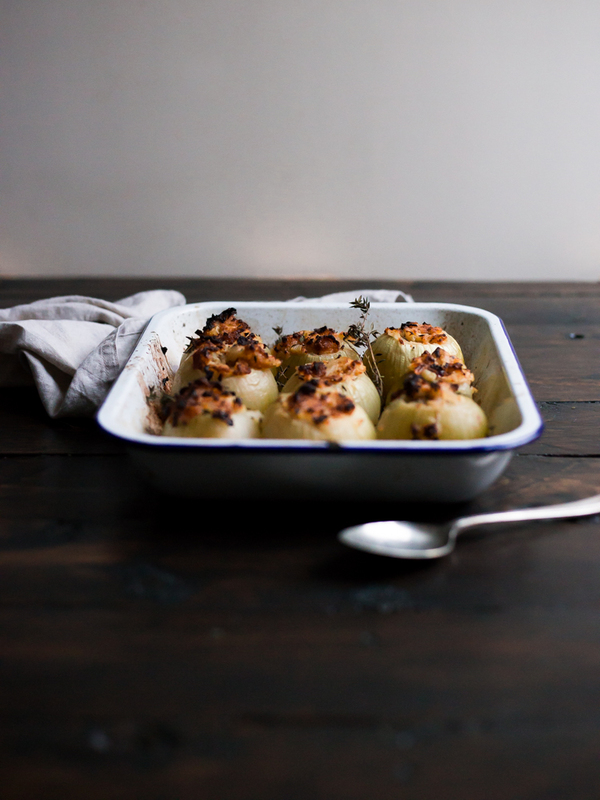 I enjoyed them as a side dish with some grilled chicken and buttery sauteed kale, I think they’d be a nice addition to your Sunday roast (or even Christmas dinner, if you dare think so far ahead!). Speaking of which, I’m sharing this recipe with Abi from These Four Walls. Have a pop on over to her blog for lots of festive inspiration! Heat oven to 180 C fan / 200 C / gas 6. Prepare the onions by cutting the ends off both top and bottom, enough so that the onion is flat and both sides. Peel the skin off the onions. 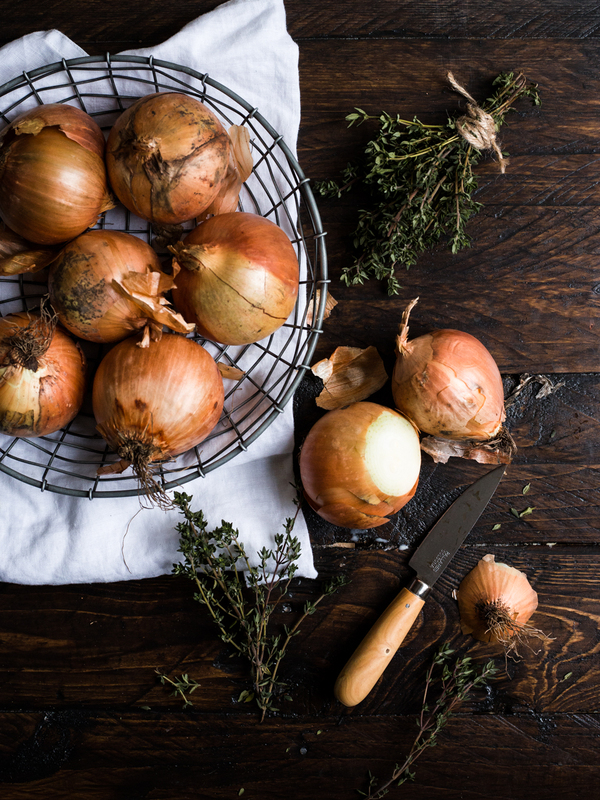 With a sharp knife, score a cross in the centre of the onion piercing down to the bottom, up to the edge leaving one or two of the outer layers. Score a circle around the cross and again right through to the bottom as you do this. Repeat with remaining onions. Scoop out the flesh of the onion using a teaspoon, trying to keep the bottom intact if you can. Scoop out the flesh of each onion until you have a little hollow cup. Finely chop half of the scooped out flesh and reserve to one side. Place the onions in a large pan. Pour over boiling water from the kettle and bring back to the boil over a medium heat. Once boiling, simmer for 15 - 20 minutes (until the onions are tender but are still holding their shape). While the onions are blanching, heat a frying pan and add the butter. Saute the reserved onions along with the bacon and the leaves from 6 sprigs of thyme for 6 - 8 minutes. Add half the wine and simmer until reduced. Remove the frying pan from the heat. To the pan, add the breadcrumbs, creme fraiche, parmesan and a good seasoning of salt and pepper. Stir to combine. Reserve approx 75ml of the onion water. Carefully drain the onions and place hole side up in a roasting tray. Nestle them quite close together and then divide the stuffing mixture between each of the onions. Pour the remaining wine along with the onion water around the onions. 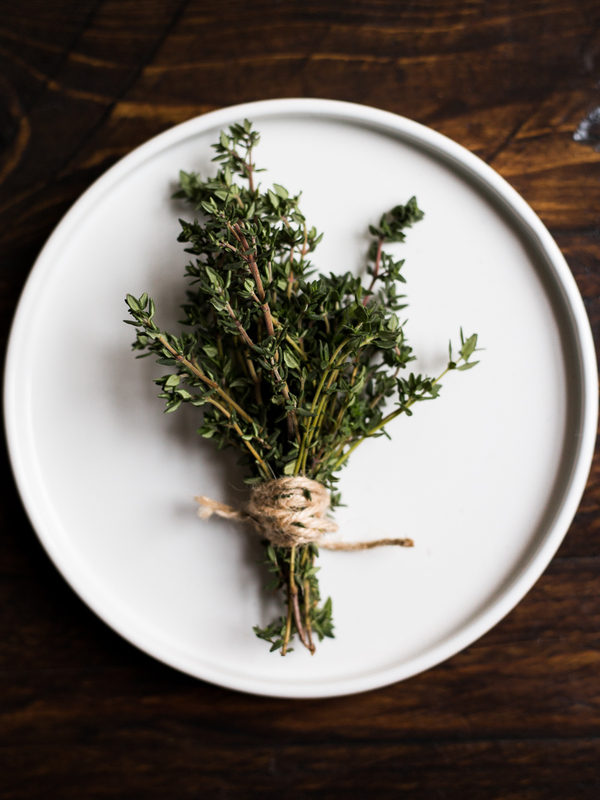 Drizzle the tops of the onions with the olive oil and nestle the rest of the thyme sprigs in between. Bake for 25 minutes in the oven.